The winner of the Artisan Notebook Fuss Free Template Challenge for the month of August is . . . Lou Ann aka lmgdonahue with her layout "My Heart." I love the photo editing and overlays she used as well as her mix of different kits that mesh into one cohesively themed page. 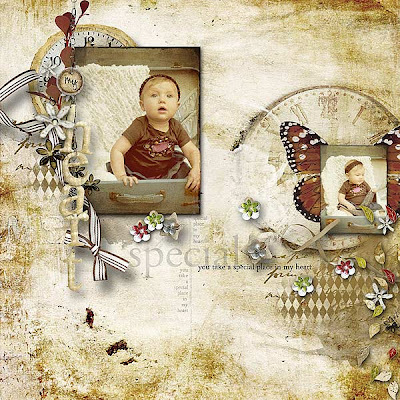 Lou Ann has won her choice of one of my template packs as well as a three month Guild membership and her layout will be featured in the October issue of The Artisan Notebook. Thanks to everyone who joined in the challenge. I hope you enjoyed the template, and I look forward to seeing what each of you creates this month! Remember, the September Template Challenge is still open! beautiful layout and beautiful kit. They compliment each other perfectly. Congrats! Thanks so much Cheryl! I am crazy for your templates!!! !